I haven’t been doing much sewing. I did clean up the sewing area, specifically the table that Chunguita and Pulguito use to create. Before Pulguito was mobile, Chunguita used a kid’s table, but that had to change when he started walking. So she got my 40″ high worktable, accessible with a stool. Pulguito is now old enough to create as well, so he was allowed to climb up on a stepstool, too. I decided the potential for falling off a stool was too great with both of them up there. Clean off the cutting table which would be folded up to make room for the kid’s table. Clean off the worktable to put the stuff from the cutting table. You would think it wouldn’t be that hard, but as soon as I got the work table cleanned up, the kids would make another mess. It’s not like I have time to do this all at once, and for my sanity’s sake, I admit, I let them make the mess while I was tring to keep everything clean. I wasn’t able to do it until MIL and SIL’s were there to occupy the kids. Did I menttion that I adore my MIL? She’s the sweetest person in the world, and she loves to watch the kids. She and DH took them to the park, and I was finally able to get everything in order for us to all create at the same time. 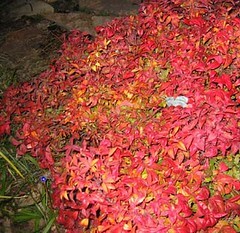 Btw, the image is of the gulfstream nandina that I have in the front yard. Nandina’s can take a lot of abuse and are drought resistant, so you see a lot of scraggly, neglected ones, but they can be very beautiful and add gorgeous color to a garden in the winter. The sun was shining for a while.